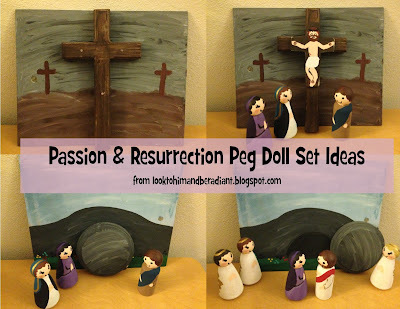 Peg doll sets have become my go-to gift for the kiddos in my life, so after making my niece a peg doll nativity, I needed to come up with a different set to create for her little brother. My sister suggested that they needed more animals to go with a barn they already had, so Noah's Ark seemed a perfect choice. I decided to make this a natural set instead of painted after loving (so much!) how my other nephew's woodburned nativity turned out. 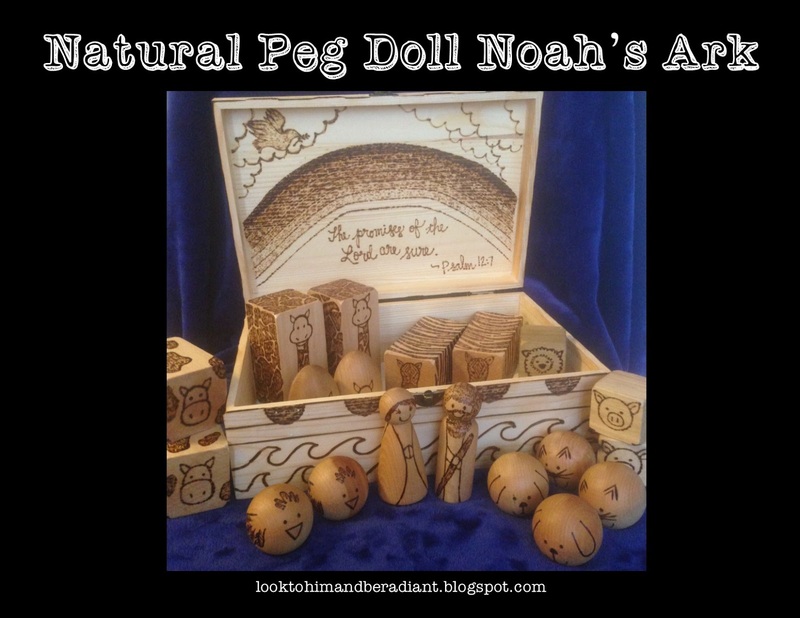 In this post, I'll share some pictures of the dolls, animals, and ark that you could use for ideas/patterns if you would like to try making a set of your own. All of the steps, including set up, woodburning, staining, and sealing can be found in great detail in my original Woodburned Peg Doll Nativity post. I thought I would save a little time and send you there instead of recreating everything. The rest of this post will just include pictures of this project. -The box I used is from Hobby Lobby. Unfortunately, I can't link right to the product I used, but I love these boxes. They are sturdy and you can get them individually in store. The medium one listed at that link is the one featured in this post. Ok, first up, the storage box gets turned into an ark! There were also camels made with 2 1/2" eggs... but I didn't get a picture of them apparently. You can check out the nativity post to see the Wise Men's camels if you'd like to add them to your ark. I think it turned out pretty cute! 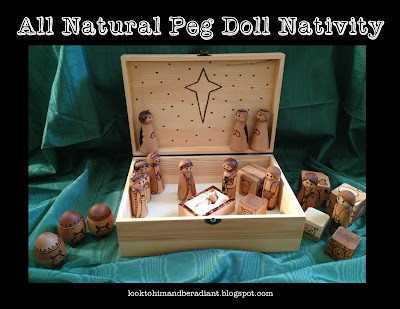 Remember, if you are interested in more step-by-step details, check out the nativity post linked just below. We often don't get to celebrate Pentecost during the school year, as it falls fifty days after Easter (this year it is on June 4th). I thought I'd share a quick art idea connecting Pentecost and the Sacrament of Confirmation. With a little review of the Sacraments, you can work Pentecost in any time of year. As part of our review of the Sacraments of Initiation, my students learn more about the Seven Gifts of the Holy Spirit. We read several passages from Scripture, including the account of Pentecost above. We talk about how the Holy Spirit, the Third Person of the Trinity, has always existed and will always exist. And we connect that the Holy Spirit that was received by Mary and the Apostles at the first Pentecost after the Resurrection is the very same Holy Spirit that the students will receive at their Confirmation. 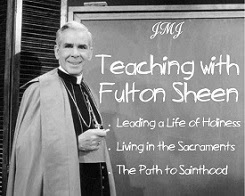 We will use this Confirmation Foldable and add it to our Confirmation page in our Fulton Sheen Notebooks. Then we did a basic art lesson about self portraits (balance, proportions of the face, size of features, looking in a mirror, etc.) and the students each created an image of their own face. They also used red, orange, and yellow paper to create flames hovering above their heads. The results were awesome! I hope that it helps the kids start to internalize the relationship with the Holy Spirit they are invited into, and how it is strengthened by Confirmation. We displayed the Pentecost Self Portraits on our classroom door (no bulletin board=creativity) with a fiery dove, wind and a "Come Holy Spirit" sign. This completed our Doors to the Sacraments for Christian Initiation: you can see Baptism here and the Eucharist here. During January, teachers and parents often weave lessons and discussions about the dignity of the human person into their plans and activities. This truth is important every day of the year, but remembering Martin Luther King Jr., the anniversary of Roe V. Wade, and the March for Life present us with teachable moments that are relevant today. As I make plans for some of those important discussions in the coming weeks, I am excited to start using The Culture of Life Study Program created by the America Life League. I'm so impressed by the curriculum they have created and grateful to add this new resources to my classroom content. Go click on over to their website to explore all the things they offer (including both print and digital lessons for purchase and many FREE instant downloads to get you started, like this set of sample lessons.). 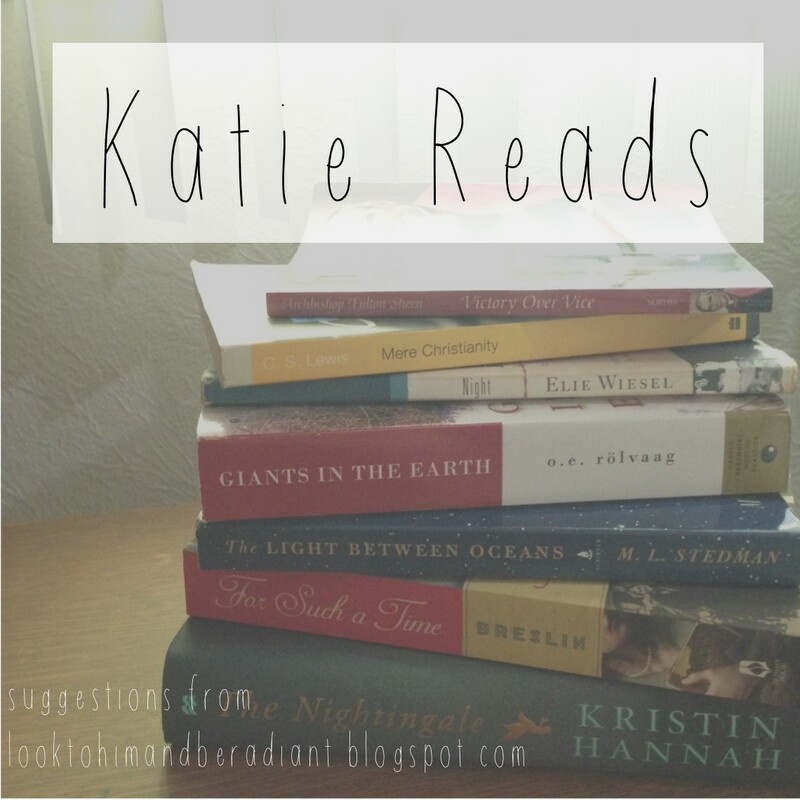 If you'd like more info or to hear my humble opinion about some of the resources they offer, read on :). Disclaimer: American Life League provided me with free lessons and materials in exchange for an honest review. All thoughts and opinions are my own! I'm happy to share this solid resource with other educators. This program includes lessons for preschoolers through high schoolers, organized into both stand alone mini lessons as well as full units of study. The cohesive nature of the units would allow a religious ed program, school, or family to develop continual growth of understanding about the culture of life over the education of its students. The lessons are also supplemented with Scripture, art, hands-on models, literature, and media, providing opportunities for all types of learners to engage with the material. 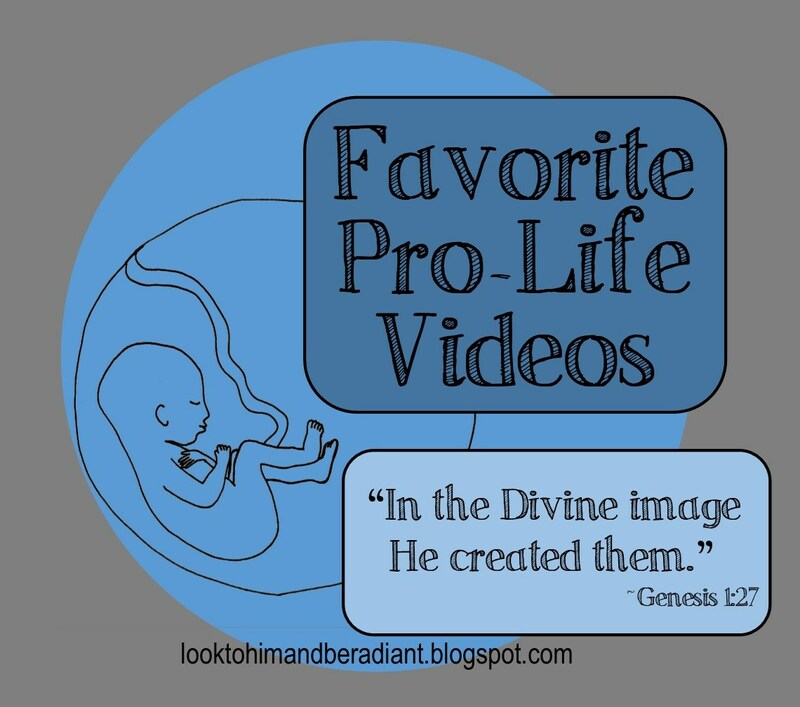 They cover pro-life topics with both depth and breadth. Many times kids (and adults) think that pro-life topics are limited to pre-born babies instead of recognizing the dignity of each and every human person. 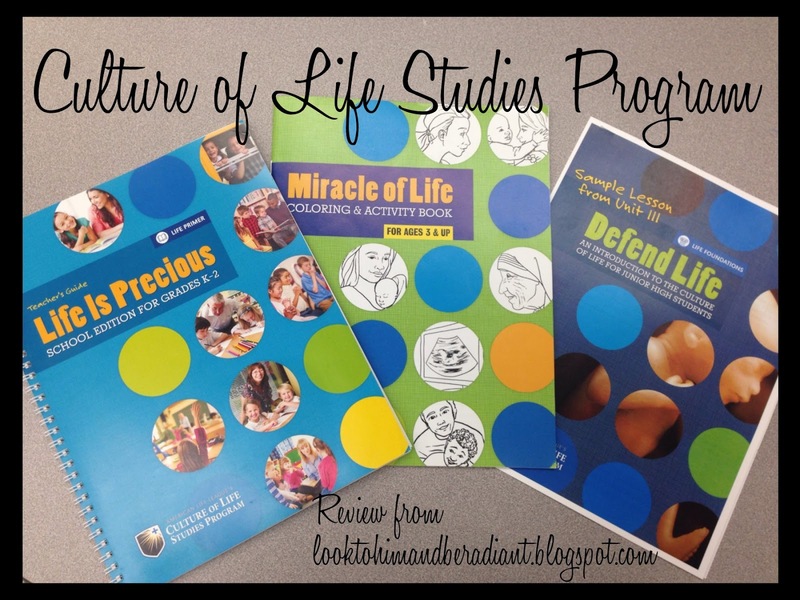 The Culture of Life Study Program offers materials on babies, the elderly, disabilities, eugenics, diversity, marriage, euthanasia, social justice, and more. The cross-curricular lessons are intended to tie into literature, science, art... and even foreign language classes! All of the Units of Study and Mini Lessons are organized, complete, and thorough. As a teacher, I love that the authors have included not only the recommended steps for an activity or lesson, but also objectives, ideas for reinforcement and evaluation, supply lists, sample discussion questions, color photos of sample student work, opening/closing prayers, etc. They really have thought of everything related to this curriculum and have organized it into easy to follow lessons, including appendices of handouts/printables. 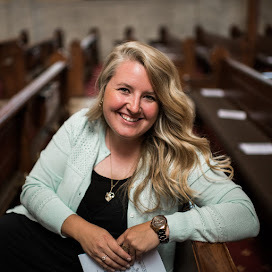 From the experienced to the novice, I know that any teacher, catechist, youth leader, or parent could comfortably and successfully use these lessons. Some of the lessons are created as one time activities, like this book study, discussion, and art project about Mother Teresa. Others are multi-day units covering more content, such as The Beauty of the Developing Human Being for 7th-8th graders. And other materials, like the sweet Miracle of Life Coloring and Activity Book, could be used time and time again to promote pro-life conversations and formation. The Culture of Life Units of Study are setting up a sequence of lessons for the full education of a student. The units begin with the Life Primer in elementary, move to Life Foundations in middle school, and offer Life Lens, Life Scope, and Life Quest in high school. Included in the Life is Precious Unit Study for K-2nd grades is the video Baby Steps, which offers 4-D Ultrasound imagery of babies 8-34 weeks. Menu options let you watch the babies grow at each week of development, seeing them kick, wiggle, smile, and yawn. There also is a Guided Tour feature, which gives a five minute narrated week-by-week overview of fetal development. (You can watch the English narrated version here.) They also send a Precious One 12 week fetal model for the students to see and touch. I've written here before about how much I love the Touch of Life Fetal Models. 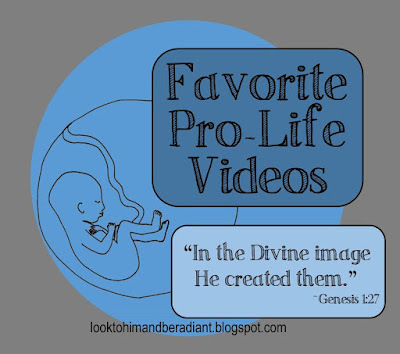 They continue to be one of my very favorite pro-life resource. Teachers of any kind will tell you that time is at a premium. Adding in another unit might seem impossible, but these lessons fit well within many different subject areas and even use books and movies that are often already in a classroom curriculum. Content in the Life Primer Unit (K-2nd) includes popular picture books (like Horton Hears a Who and On the Night You Were Born) to introduce each topic. Discussion guides are available for chapter books like The Lion, the Witch, and the Wardrobe, The Giver series, and To Kill a Mockingbird, just to name a few. There are also a whole collection of discussion guides for modern movies, teaching kids to look for culture of life themes in everything they read and watch. There are lessons for some of my favorite movies including The Blind Side, August Rush, The King's Speech, Bella, The Magic of Ordinary Days, and It's a Wonderful Life. 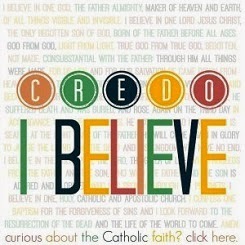 Those movie discussions would lend themselves perfectly to a youth group or pro-life club. The exciting thing is that the Culture of Life Studies Program is still in development. More and more lessons will be added, creating a full K-12 scope and sequence. I'll be keeping an eye out for the additional curriculum, especially in Life Foundations. In the meantime, you should go check out the current materials in their store (including many FREE downloads! ), the ever-growing topics and ideas on their blog, and consider making a donation to fund the next unit of study. I hope you are feeling inspired this month (and always!) 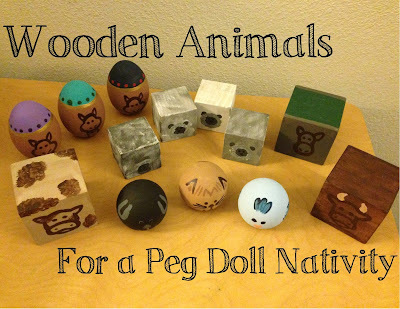 to weave culture of life conversations and lessons into your classrooms and homes.